Gianluca Tondi, owner of TM Italia Cucine, designed the Petra Kitchen presented at the Abitare il Tempo trade fair. 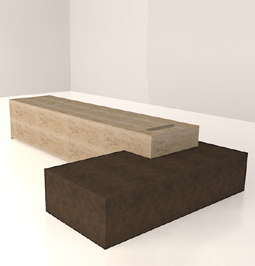 Petra is a new type of custom kitchen that conceals the working components when not in use. 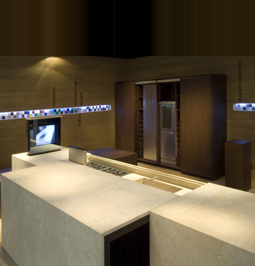 A remote control opens the travertine top to reveal the cooktop and downdraft ventilation. The faucet and oven are also mechanized to raise and lower. 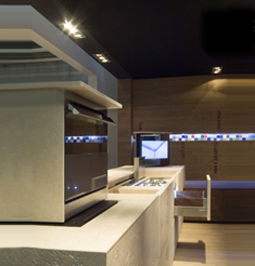 TM Italia Cucine calls their home automation system (domotics) “TM_touch’n’go”. With the touch of a button you can open the kitchen and view the monitor, “TM_Vison,” for watching television or use the Internet connection for searching the web. The monitor is show raised on the left end in the first two photos. The tall cabinets are also sleek and have no decorative hardware housing dishes and the refrigerator. I would love to have seen this in person.